1What is a Spiritual Life Coach? Spiritual life coaching is anchored in the conviction that each of us is innately whole and incredibly powerful. Through the coaching process, we recognize our inherent power – that we have, consciously or unconsciously, created where we are and that we can create shifts if we don’t like what we’re currently experiencing. We typically don’t focus on the surface issues or problems in your life in the sense that they are not the primary emphasis of coaching sessions. Instead, the process recognizes your inherent wholeness and your coach works with you to uncover, recognize and release the thought patterns and beliefs that are keeping you stuck in those situations – we target the actual root cause. As those limiting thought patterns and beliefs are released, as the “weeds” are pulled out from their roots – the surface issues you may have been experiencing tend to resolve on their own. Spiritual life coaching is not affiliated with any particular religion – the work is of a non-denominational nature. It can include prayer, though it doesn’t have to. We consciously acknowledge our divine nature with an awareness of the omnipresence of Spirit, Source, God, the Universe – whatever you choose to call it, and evaluate your life through the prism of love, wholeness, peace, balance, and joy. In working with a qualified spiritual coach, you’ll be able to recognize more clearly when your thoughts and actions are moving you towards or away from those qualities you wish to expand and experience more of. Through your work with a spiritual life coach, you will develop the confidence to listen to your inner wisdom rather than seeking input and direction from outside of yourself. You will also learn tools and techniques that will help you amplify your awareness of this inner wisdom so that you can more confidently take action based on insights and inspiration that come up. A good spiritual life coach won’t tell you what to do. He/she will help you understand what’s at the root of your dilemma, highlight important considerations based on your values and desires, and help you clear out the gremlins that are blocking your path. As we change, everything around us changes. When life seems difficult or troubling, it’s often most constructive to use those difficulties as an opportunity to dig deeper to uncover the root cause of the issue. Invariably it’s tied to a limiting belief of some kind that’s ready to be healed. By working on your inner game and becoming aware of limiting thoughts and beliefs that are keeping you from living the life you desire, you can transform every area of your life. Cleaning up those limiting beliefs creates space for tremendous shifts in your life experience – everything from your relationships with others, to your finances, to your health and well-being, to your work life. Through the process of working with a spiritual life coach, you are better able to connect with your inner guidance and listen to the whispers and wisdom of SoulSM. You can connect at a deeper level with those around you because you’re more grounded in the whole Truth of who you are. 2What topics are addressed in a spiritual life coaching session? What are you seeking and why? What brings joy into your life? What are the obstacles keeping you from living the life you desire? What brings you a feeling of deep inner peace? What do you consider sacred and why? How best can you share your gifts with the world? In digging into these types of questions, clients begin to experience a transformation in their lives as they better understand what they are truly seeking and why, what is blocking them, and how they can start moving in the right direction. 3Can you help me find my life’s purpose? There is much talk these days about finding and living your life’s purpose. I often find that phrase, life’s purpose, to feel a bit daunting – like there is only one thing we’re each here to do. And then the task can feel like finding a needle in a haystack, and a feeling that if we don’t find “it” we’ll be left searching for the rest of our lives. I find that it’s often easier to think about the numerous gifts and talents that each one of us has, and how we can leverage and share those gifts and talents with the world in a way that brings joy to ourselves and to others. A spiritual life coach can absolutely help you navigate this process. 4Where are your coaching sessions conducted? All one-on-one coaching sessions are conducted over the phone or Zoom, which is a video conferencing service. Geography is not an obstacle! You simply need a phone or computer and a quiet place where you won’t be disturbed. I strongly recommend that you have a journal or notebook handy so that you can capture any insights that come up or any action items you commit to. 5How does “spiritual life coaching” differ from traditional “life coaching”? Traditional life coaching tends to be more focused on the achievement of goals and has a propensity towards action and a task orientation (i.e., here are the steps I need to take to accomplish “X”). A life coach helps clients ensure that their goals are aligned with their values, and holds the client accountable for completing the necessary tasks so that he/she can achieve the “outer game” results they are seeking. Spiritual life coaching, on the other hand, is focused more on one’s “inner game” – the beliefs and emotions, both expansive and limiting, which shape one’s experience of life. Typically, one’s limiting beliefs – e.g., “I’m not smart enough to do ‘X’” or, perhaps, “no one from my family has ever done ‘X’, so there’s no way I could do it either,” or even “life isn’t working out for me” – create unconscious blocks that prevent people from accomplishing their goals and realizing their desires. Identifying, working through and clearing those limiting beliefs and stories is a significant component of the spiritual life coaching process as the coach helps the client recognize and return to their inherent wholeness. As the “inner game” is cleaned up, the “outer game” of conditions and experiences in one’s life begins to shift as well. Things that had seemed impossible in the past start to work themselves out and inspiration strikes for better ways to get things done. Instead of feeling like you’re pushing a boulder uphill it feels like creation is conspiring for your good. A spiritual life coach will also work with the client to tap into their “inner wisdom,” that part of us that is connected to all of creation and knows everything about everything. Clients learn tools and techniques to quiet the mind and create space for that inner wisdom to emerge clearly. In connecting with that inner wisdom, clients find that their intuition improves – they just know what to do more and more frequently. And it is through this improved connection with their inner wisdom, combined with a greater sense of peace, balance and harmony, that clients experience real and significant changes in their life experience. Throughout the process, the spiritual life coach will hold you accountable for the commitments that you make to yourself, and help you navigate situations where upholding those commitments is challenging for some reason so that you can continue to move forward in the direction you desire. If you’re interested in exploring whether working with a spiritual life coach is right for you, why not schedule a complimentary Unleash Your Awesome coaching session to find out? 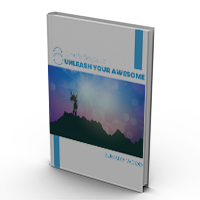 Sign up to receive a free download of Sumaiya’s 6 Simple Steps to Unleash Your Awesome eBook. You’ll also receive other free content to keep you inspired!